“…tea, coffee, hot chocolate or…” words so often heard in my small café. For some, it’s an excuse to take a break and think their thoughts. For others, talking with friends. Some want nothing more than a sympathetic ear. So it seemed with my regular morning customer, one coffee and a friendly ear. Harry had lost his wife and missed their mornings’ coffees together. With his coffee, he shared his life, his children and grandchildren. In time, he joined his wife. I missed our conversations. Poor Harry!! What a bittersweet story. Thanks for the comment.I’ve known a “Harry”. I like how undramatically you tell the story. Makes it very real, and touching. Thanks for the comment. I thought a low key approach suited the story. Awwww, that’s cute. It’s great that in the time it takes to have a coffee every day so much of life can be shared. Thanks for the comment. Many lives have been shared over simple tasks. A lovely story, beautifully told. Although it’s sad, I just felt the love from the cafe owner for Harry and was curious to know more about him. Coffee can be so much more than just a drink, can’t it? Thanks for the comment. A cup of coffee, a cup of tea, or a cool drink on a hot day is always a good time to share a life. This story tore at my heart. Beautifully written. Thanks for the comment. 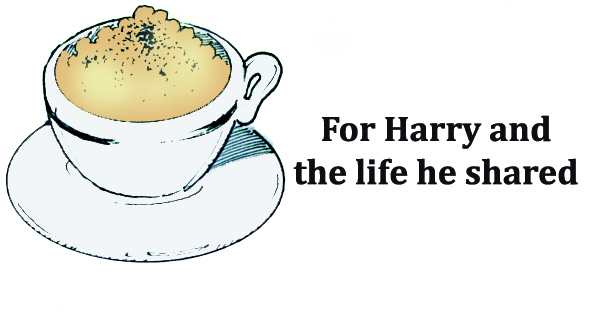 I think many of us would know a “Harry” of “Harriet”. Very touching and I can see him clearly. Thanks for the comment. I try to picture characters when writing. It helps add a more personal touch to them. Reblogged this on Treadmill Diaries. I use a few blog sources for my blogs but do like those powered by WordPress. The free platform is quite capable but I do pay premium for some of my blogs where I want more features or capabilities although this blog isn’t a premium. I’d suggest trying it out and seeing how it goes.